Kitchen and Residential Design: This toilet will change your life! 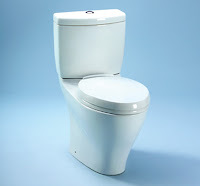 This is the Aquia toilet by Toto (http://www.totousa.com/). What it carries is a technology that new in the US, but is ubiquitous throughout the rest of the developed (and a lot of the developing) world. What our friends at Toto have done is brought this "new" idea in toiletry (is that a proper use of the term?) to the US market and how it hasn't taken off shocks me. The Aquia is a dual flush toilet. What that means is that the flush button on the top of the tank is split into two sides. Pressing the left side initiates a .9 gallon flush. We'll call that the number one side. Pressing the right side gets you a 1.6 gallon flush and we'll call that the number two side. It makes sense, perfect sense; yet if you ask for one at a Home Depot or a Lowe's you will be met with the blank stare of the tragically unaware. The United States is on a collision course with a water disaster. The conventional vision of what constitutes a decent lifestyle is unsustainable. The problem is not the US standard of living. The problem is the way Americans use their scarce resources. Real high on that list of misallocated and misunderstood resources is clean, safe tap water. That drinking water gets used to irrigate lawns, and to hose off sidewalks, and to wash cars, and to flush toilets is madness. Madness! Average, daily, per capita, household water use is estimated to be 69.3 gallons. I live in a city of 250,000 souls and that means we consume on average 17,325,000 gallons for household use every day. But that's using a national statistic to get a local result. The per capita household number in Saint Pete, Florida is actually 89 gallons. That means Saint Pete needs 22,250,000 gallons of water a day for showers, tap water, dishwashers, clothes washers, lawn sprinklers, swimming pools and toilets. That is a lot of water. It's a lot of water that needs to be piped in from counties other than our own. Add in the needs of the 3 and a half million other souls who share Tampa Bay with us and that is a huge amount of fresh water that's piped into this burgeoning region of the country. I'm not the first person to say this, but it can't last. The Florida aquifer where that water comes from is in trouble and there are Draconian measures in the works. It is past time to rethink the way we use water. Going back to that 69.3 gallon per capita average, 18.5 gallons of that total goes to toilet flushing. 18-and-a-half gallons of fresh, treated, potable water gets fouled every day to dispose of about a quart of waste, pardon my indelicacy. Those 18-and-a-half gallons are a logical place to look to cut back on overall water use. The dual-flush toilet is a perfect step in that direction. My water-use statistics came from The American Water Works Association, a trade group for the US water industry. You can review their figures yourself and find some great ideas about water conservation on their website, http://www.drinktap.org/. My local use statistics came from the Pinellas County Utilities Commision, http://www.co.pinellas.fl.us/. Contrary to what you'll hear from the Rush Limbaughs of the world, water conservation is not a concern that's the sole province of the soft-hearted and soft-headed. The water problems the US is steaming toward are real and they will be ugly. However a pretty toilet from a Japanese plumbing company might be enough to hold all that nastiness at bay. For a while anyhow.